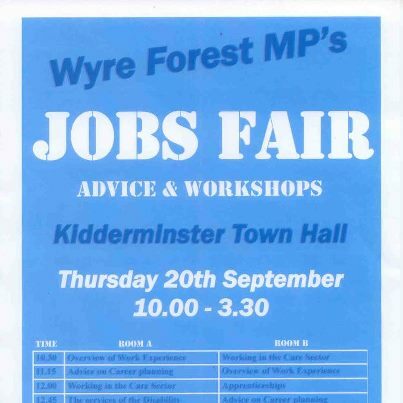 A jobs fair in Wyre Forest will take place at Kidderminster Town Hall on 20 September to help local people find work. Organised by the area’s MP, the fair emphasises local people for local jobs and aims to bring as many job seekers together with employers. The MP, who previously organised a successful similar event in March, believes that this fair will be even bigger and he is hopeful of job seekers applying and securing interviews for available jobs on the day. He stated that he wants the event to make the job hunting process a little easier. The fair will boast 35 stalls taken by employers and organisations who can offer advice and training opportunities. Attendees will include local companies Lawrence Recycling, Encryption IT Services, Thomas Vale and West Midland Safari Park as well as national organisations such as Lloyds TSB, Premier Inn, Worcestershire County Council, Marks and Spencer and West Marcia College. Companies such as Kidderminster College and Vital Links will give information on further education and training while recruitment agencies will provide guidance on CVs, job hunting and careers. The fair will also offer advice to anyone who is thinking of setting up their own business. It’s always best to take your copies of your CV in case you would apply for jobs during the jobs fairs. you should also take your proof of your identity if you been asked by the employers when you apply for their positions. Try to create networks, be firend with other job seekers and dress smart. Good luck with the jobs fair in Wyre Forest.